Predicting the future is hard. And yet, political anoraks absolutely love it. So while I’m not even 100% sure what I’m doing next Friday, I can’t help but think about how the political terrain will look four years from now. It might seem strange to be ruminating on that not long after the seats in the convention halls in Tampa and Charlotte flipped back into the upright position, but really there’s no better time. Nobody would have given Barack Obama a snowball’s chance in Tucson of winning in 2008 had he not brought the house down in 2004. Bill Clinton nearly derailed his chances of election in 1992 after a off-par performance in 1988. Conventions matter, not just as a way to big up the candidate, but for the people doing the bigging up, it acts as an audition. And so in 2016, after which will almost certainly be eight years of a Democratic White House, who will be the dramatis personae? On the Republican side, a drastic change will have to be made. To stand any chance in 2016 they’ll need to steer their rudderless boat back towards Eisenhower, and their current leadership is utterly devoid of anyone capable enough (or magnanimous enough)to take up that challenge, let alone the White House. John Huntsman might be the man to do it, but he’s persona non grata in the party at the minute, and that’s kinda the problem. So while it’s likely some fresh newcomer will take up the reins and start rebuilding the GOP for 2016, among the people we know Marco Rubio and Chris Christie look to be the frontrunners so far, with possibly Bob McDonnell of Virginia in the mix too. Based on the convention speech test Rubio is the best bet of those three, and in spite of his Tea Party credentials seems the most able to reconnect with the public and widening the base of a Republican party too reliant on angry white guys. Not my words, Senator Lindsay Graham’s. Beyond those early frontrunners interesting choices outside the angry white guy motif would be Ohio moderate Rob Portman, New Hampshire Senator Kelly Ayotte, New Mexico Governor Susana Martinez or even Jeb Bush, who converted to Catholicism and carried a substantial Latino vote when he was Governor of Florida. Or failing that his son, George P Bush, might be worth an outside shot later down the line. On the Democratic side, the depth chart looks a lot more promising, but that has its own dangers. Joe Biden will be in his seventies by the next election, but after a resonant and genuine speech at the DNC this year all thing staying the same you would disregard him at your peril. Similarly, Hillary Clinton’s profile is as strong as it ever was, and her husband’s star turn on Wednesday night will have done her no harm at all. 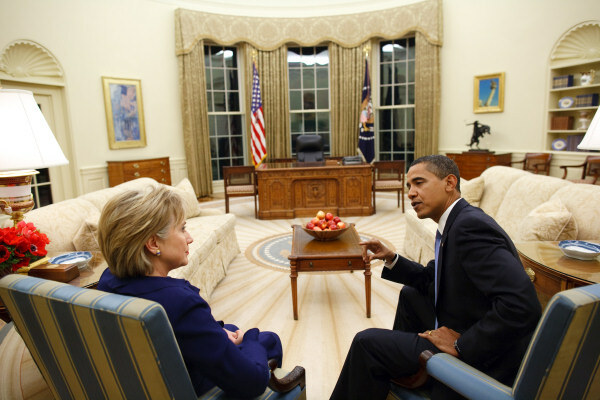 2008 may have been her last and best chance at sitting in the Oval Office, but if she thinks she has half a chance, she’ll definitely be in the mix. Elsewhere Elizabeth Warren’s star continues to rise and if she becomes a Senator at the end of this year she’ll no doubt be on the inside track for 2016 if she wants it. From the ever-plentiful pool of capable Governors, New York’s Andrew Cuomo is a strong bet and Deval Patrick of Massachusetts could make a decent challenge if his convention speech is anything to go by. But my personal tip to watch is Maryland’s Martin O’Malley: two term Governor, former Mayor of Baltimore, former Dropkick Murphys-style bandleader and, so the story goes, slight inspiration for Mayor Carcetti in The Wire. He’s bright, he’s ambitious, and he’s definitely one to watch. But 2016 is miles away, and plenty of time for someone else to surge through. Or, more likely, for one of the aforementioned front runners to slip up.